Our Middlesbrough Hub, which is branded Middlesbrough Reads, is supporting the Bath, Book, Bed campaign from BookTrust this week by giving away a selection of extra books at Child Health Clinics taking place across the town. 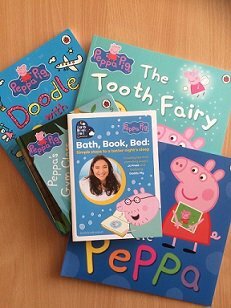 Thanks to a partnership with Middlesbrough Council and Public Health, we are gifting a selection of Peppa Pig titles, kindly donated by Penguin Random House, to families visiting Child Health Clinics. Families attend the clinics to receive advice, support, and information about their child's development, or to discuss any health, breast feeding or weaning concerns they might have. The Bath, Book, Bed campaign from BookTrust is fronted by childcare expert Jo Frost. It offers simple steps to a straightforward bedtime routine, which will help children to have a better night's sleep. "It's never to early to start sharing stories with your little one and just 10 minutes a day can make a difference. We're thrilled to support the Bath, Book, Bed campaign and gift Middlesbrough families these brilliant books to help them to put the campaign advice into practice."